and get your own two 3" x 4" x 8' Landscape Timbers! (approx. $7.00 at garden centers) WOW! The Kayak Storage Solution for those with no indoor wall space. Choose from our Multi-Purpose J-Cradle System and optional wall mount clips that allow you to carry kayaks on your vehicle and then use those same J-Cradles for kayak storage. ...OR choose our (single purpose) J-Cradles for Kayak Storage. These are value priced for kayak storage only. Stainless Steel with thick rubber padding; Great for indoor OR outdoor use. You provide the two 3" x 4" x 8' Landscape timbers (available at most box store garden centers) and add our "Kayak Tree Ground Kit". 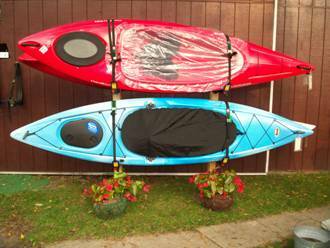 The Perfect Kayak Storage Solution for the homeowner, lakeside installations, even with no garage! Our Kayak Storage J-Cradles! Heavy Duty Stainless Steel construction with thick rubber padding. Back side is pre-drilled for EZ screw mounting. Be kind to your expensive poly or composite kayaks. 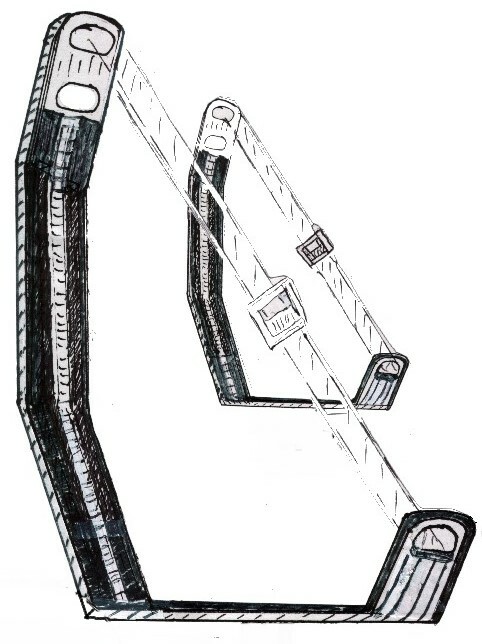 Our single purpose kayak storage "J" Cradles will store boats in a minimum of space. Winter storage... Simply tarp over everything or remove leaving no trace! Stainless Steel, heavy duty rubber padded. 23" high x 2.5" wide x 15" from wall. Look closely and you will see four 12' kayaks on two posts in the ground. All in a 14' x 5' space, free standing! Weather proof up to 69 mph wind and rain when properly installed. Same shape as our famous dual purpose J-Cradles for car racks, but fitted for a simple wall installation. 3/4" rubber padding, includes 2 straps and mounting hardware to wood structure. Compare our 3" wide, padded surface to competitors bent 1" aluminum pipe with a plastic sleeve covering. 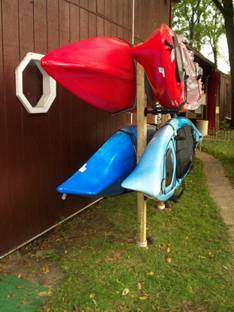 Kayaks on this side of the tree are on our single purpose basic J-Storage Wall Cradles. These are value priced and like our famous Deluxe J-Cradles are 2.5" wide stainless steel, rubber padded and 23" high for easy access to the 2 tie-down straps. 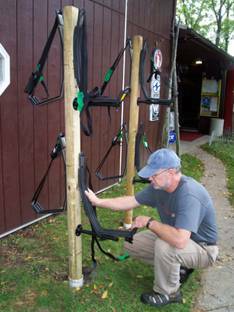 The kayaks on this side of the tree are installed with our famous dual purpose Deluxe J Cradles that double as a stacker (back side is padded) on your car and can move to wall storage with our Wall Mount Kit. Yakima, Thule, others can't do this! 23" high x 3" wide x 19" from wall. Incl. 2 wall rods & 2 base mounting flanges. Includes two Wall Clips and two woodscrews for mounting. 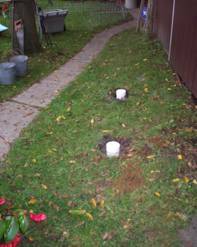 The Ground Kit consists of two 22" plastic sleeves that will be concreted into the ground and two caps to cover the sleeves when the uprights are removed. The uprights (landscape timbers 3"x 4"x 8' with two beveled sides and two flat sides), shovel and concrete are available at your local garden or lumber store. Includes 2 - 22" Inground Sleeves and cover caps. You provide the timber uprights and gravel (concrete if needed). Includes Straps and mounting screws! Stainless Steel with thick rubber padding. Dual Purpose Cradles go from Car-Top to Wall Storage. Carry Kayaks on Sides... Lays Down Flat on round bars when empty.